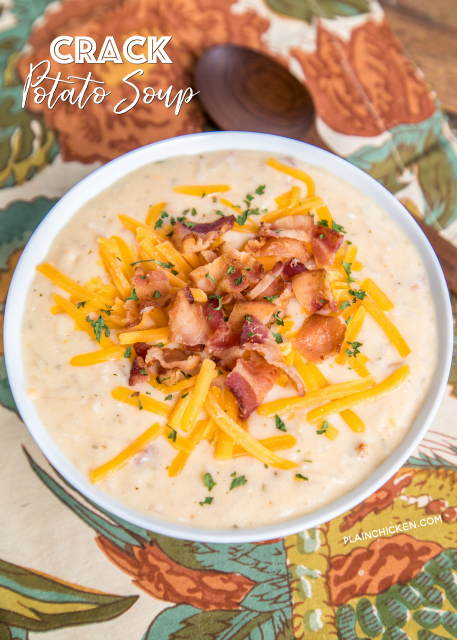 Slow Cooker Crack Potato Soup - potato soup loaded with cheddar, bacon and ranch. Stop what you are doing and add the ingredients of this Slow Cooker Crack Potato Soup to your shopping list. You must make this ASAP!! This soup is SOOOO good! I wanted to lick the bowl it was so good! Potato soup loaded with cheddar, bacon and ranch. I mean, how could this NOT be good! YUM! 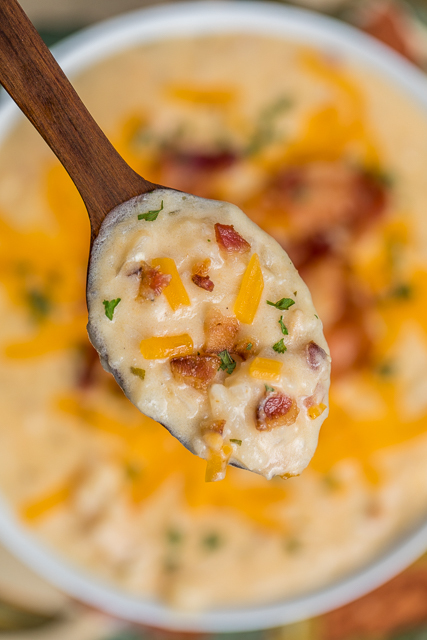 This Slow Cooker Crack Potato Soup is ridiculously easy to make. Just dump everything in the slow cooker and let it work its magic. 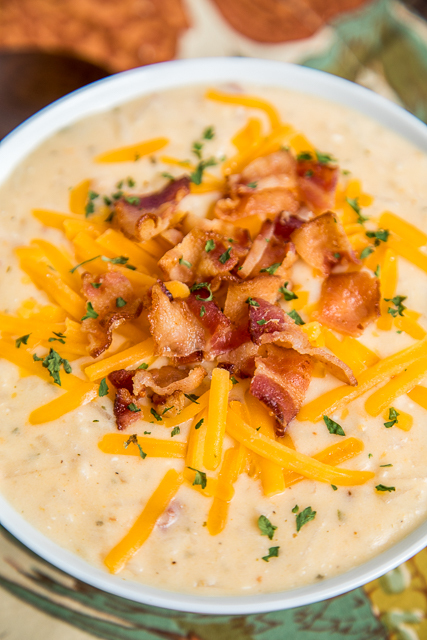 We topped the soup with extra cheese and bacon because you can never have too much cheese or bacon. Am I right?!?!?! All you need is some cornbread or biscuits and you have a crazy delicious meal without any work. This makes a lot of soup, so it is great for a crowd. We love it for tailgating or holiday get togethers. Just let everyone serve themselves straight out of the slow cooker! Combine hash browns, chicken broth, cream of chicken soup, Ranch dressing mix, and bacon in a 6-quart slow cooker. Cover and cook on LOW for 8 hours. 15 minutes before serving, stir in cheddar cheese and cream cheese until melted. Do you have a recipe that has a lot less sodium in it? This looks delicious but I am on a sodium restricted diet. You can use low-sodium chicken broth, Healthy Request Chicken soup and turkey bacon. wow how about i use real potatoes can this work instead of hash browns we are people who like real potatoes , sorry and golden ones too. Clearly, you are not people who like correct punctuation. I think the hasbrown idea is a great change. I like regular potatoes as well. Must we be such asses? I love the crack chicken noodle soup...cannot wait to try this one too❤️❤️ I love that I can throw this in the crock pot! Can’t wait to try this one!! I use hash browns whenever I make baked potato soup, so easy. But I’ve never used ranch and cream cheese. Yum Num!! Thank you for all the work and ideas!! Hi, can I do this on high for less time? I think that would work - try 3 to 4 hours on HIGH. Enjoy! Nancy did cooking it on high for 4 hours work out for you? I cooked it on high for 3.5 hrs and it turned out great. Just made this tonight, it was amazing! I used low sodium chicken broth, and substituted neufchâtel cheese for the cream cheese for a bit less fat. It came out great. We also topped ours with green onions. IS there a way to half the recipe? THis looks delicious, but would be way too much for my family of 4. Sure - the only way I know to half the recipe is to use half of each ingredient. You can also freeze the leftovers for later if you make the whole thing. My family of 2 ate it for 3 days. Leftovers are great! Is there a way to half this recipe? Converting the original numbers you'd use: Half a bag of hash browns (approximately 15-16 oz), 1 1/2 cans chicken broth, 1/2 can Cream of Chicken soup, 1/2 packet Hidden Valley dressing mix, 1/2 lb. bacon, 1/2 package (4 oz.) cream cheese, and 1 cup of shredded cheese. I have a phobia of using ranch mix in recipes for fear of it tasting really “ranchy”. Can you really taste the ranch or is it subtle? It's a subtle taste. I totally forgot it was even in the soup until I read your comment. I have a phobia of using Ranch mix in recipes for fear it will taste too “ranchy”. Is the taste strong or subtle in this soup? Do you cook the bacon first? My husband and I are having a debate about it. Can you use the Oscar Myer bacon pieces? I’m trying to make this before I leave for work and I won’t have time to cook bacon. Will it have a different affect on the out come? It will be fine with the precooked Oscar Mayer bacon pieces/bits. Enjoy! Can you use bacon pieces? I’m trying to make this before I leave for work and won’t have time to cook bacon. Will this affect the outcome? Yes - it will be just fine with the precooked bacon pieces. Can you make this in a regular pot, not a slow cooker? Sure - not sure how long it would take since I haven't made it on the stove. I bought the cubed hash browns instead of shredded, will this be ok to use? I have it cooking now!! Cant wait to try it! My husband is gluten free. Can I eliminate the cream of chicken soup? I haven’t made this without the soup. I think it needs it. Can broccoli also be added to this recipe? I think that would be delicious! I usually use the Oscar Mayer or Costco pre-cooked bacon. We just had an Aldi's open - I'll have to check their brand out!! How many packages of pre-cooked did you use? And do you microwave it beforehand or just add it? Thanks! I originally used a full 16 oz of the costco pre-cooked bacon bits. It was too salty. I'll use less next time. Although it could also have been the sharp cheddar that made it extra salty as well. What is your recommendation for reheating after freezing??? How should I reheat the soup? I do it on the stove and add a little chicken broth if it is too thick. My husband is taking this to work she he add in the cheeses on his own? Is he taking the whole crock pot or just a serving? If it is just a serving, add the cheese at home. If he is taking the whole pot to work, sure. Just add the cheese before serving. Have you ever done this with an instant pot? I want to eat it tonight but I only have 2-3 hours. I haven't tried this in the instant pot yet. I'm sure it can be done. I just haven't tested it out yet. Did you make it in the instant pot? I'm about to try it and wondering cook times. Do you think I could use the potato pieces (little potato chunks) that are also frozen? They are right next to the frozen hash browns. Not sure if this posted already but can I use the frozen potato chunks? Found next to the frozen hash browns. Or would the hash browns be better? I always use the shredded hash browns - they break up nicely as the soup cooks. You can try the potato chunks if that is all you have on hand. My guess is that it will just be chunkier soup and not as smooth. I used the frozen cubed potatoes. It was great! How long would you cook it if the hash browns are just refrigerated and not frozen? In the crockpot now! Will this thicken up a lot with the addition of the cream cheese and shredded cheddar cheese? It does thicken up as it cooks. Enjoy! Amazing! This recipe was easy to make and so good. My whole family loved it. I've made this recipe 3 times and love it. I am having a problem with getting the cream cheese to melt all the way. I've let it get room temperature every time and even cut it up into pieces and there's still a lot of chunks in it. Any suggestions on what I'm doing wrong. Thank you. I made this and it was wonderful. Going to try with red potatoes tonight.